Today is my favourite day of the year besides my birthday… its HALLOWEEN! A time when you walk down the streets and see everyone dressed up in whatever they chose. I am not dressing up this year, nor am I doing anything exciting, besides dressing up my pup as the headless horseman, BUT I will say that our house is definitely in the Halloween Spirit. 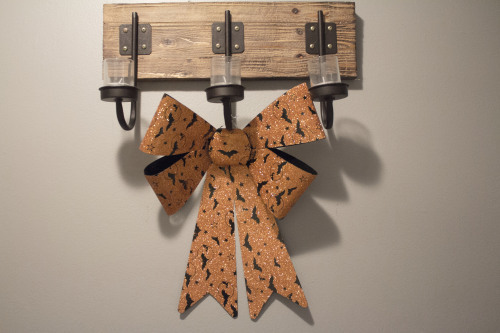 In five years I have not spent more than $100.00 on decorations for the house for this wonderful day. And you can do that too… it’s all about budgeting and looking for the best sales, and I am your girl to help you out with that! Anything I can decorate my house for, I will do it… Halloween, Christmas, Easter, Valentine’s Day… I am just that type of person. 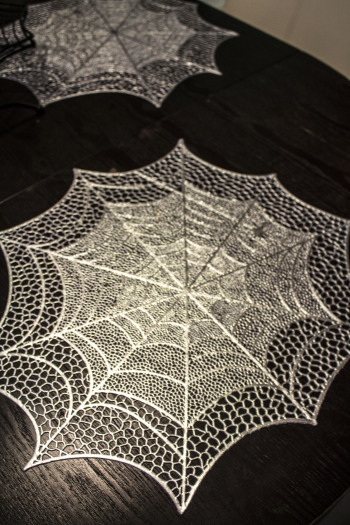 By adding these touches to your home it just makes the day that much more exciting. Where is my go to place for Halloween Decor you ask?? ?— HOMESENSE! 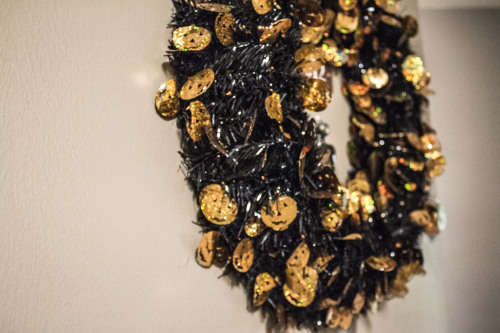 The minute I walk in there with my husband you can see the fear in his face wondering what the damage will be (there will be damage done, but he can thank me after he sees how worth it, it is- DUH) The first thing you see before you enter Extra Sparkles Please’s spooky apartment is this pumpkin Halloween wreath from Wal-Mart which for $10.00 was worth every dollar. Forget the Thanksgiving wreath, I get straight to the point come September 30th! 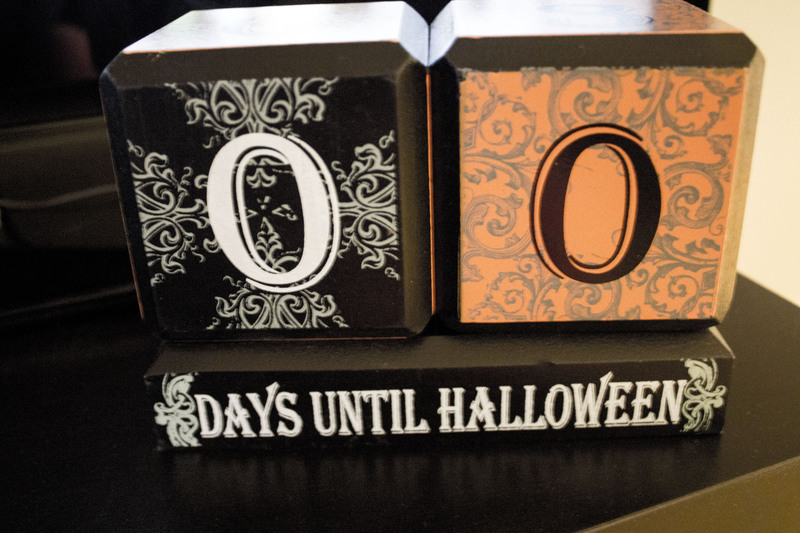 The adorable 31 days to Halloween countdown, I bought two years ago from HOMESENSE for $12.99 and I saw it there again this year… luckily the gent I married reminded me I already had one (K) But I think its a perfect piece to get everyone excited about the night that’s filled with ghosts, witches, vampires etc. 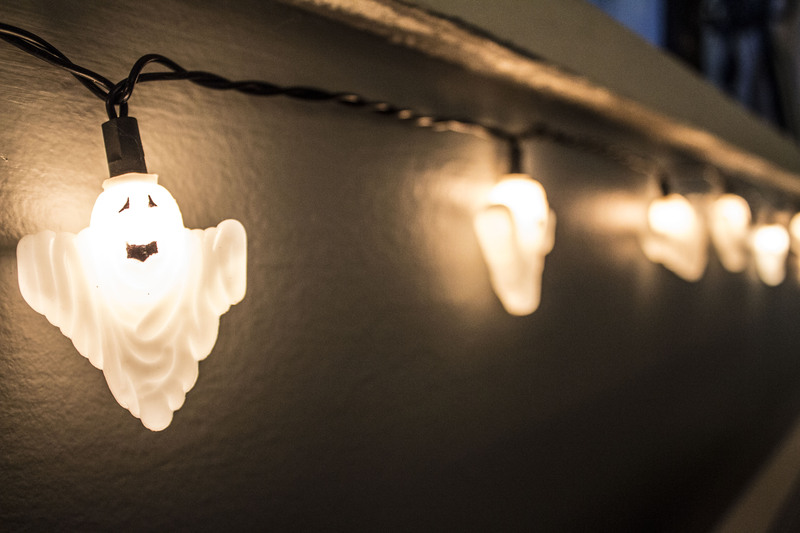 My ghosts lights from Wal-Mart were $2.99…Yup, I know amazing right? When I look at them I truthfully feel like I won the lottery! I used to have the pumpkin ones but after their long life of 5 years, they decided not to work and that it was time for me and them to part. Next up is my Haunted Train Station from Avon. 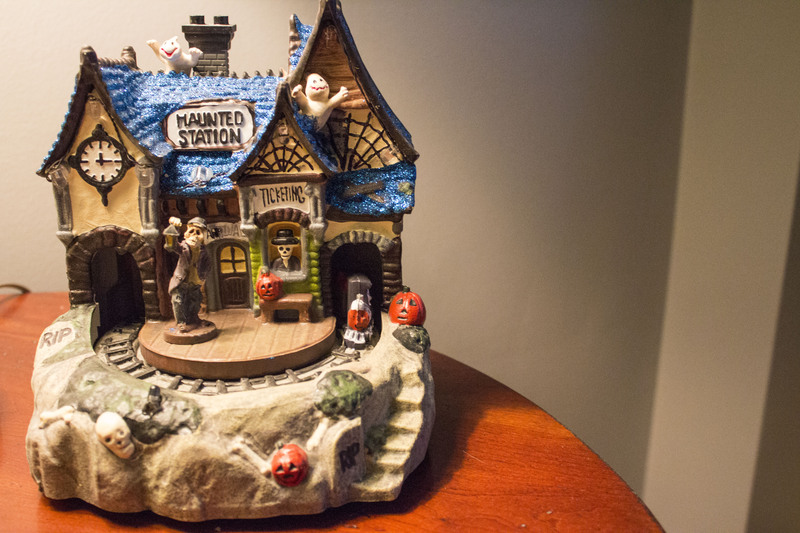 This has to be one of my favourite pieces ever, I love collecting items so then I can eventually make my own Haunted Village! It was $15.00 through my wonderful Avon sales rep, Carole and underneath it there is a switch and that’s where the magic happens. The little train comes through the tunnel and has all the goblins and ghosts you can think of! It sits on our side stand and has everyone raving about it when they come over. I would say this is my statement Halloween piece and I love it! So I was having a conversation with my pup Kimbo last weekend and he loves Halloween also. He told me that I had to get him a Halloween bed so he could have his own “Halloween decor” and I mean look at that face… what was I supposed to say, “no?” That would be just cruel. We went to Petsmart and I be lined it for the Martha Stewart collection because they were having a 75% off everything Halloween related. 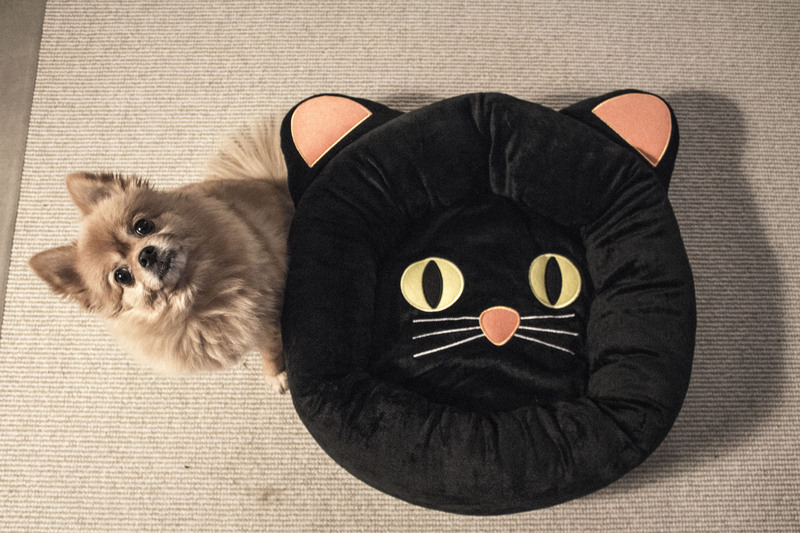 Regular $30.00 I got this cat bed for $8.00, and might I add Kimbo is very thrilled about it in case you were wondering. 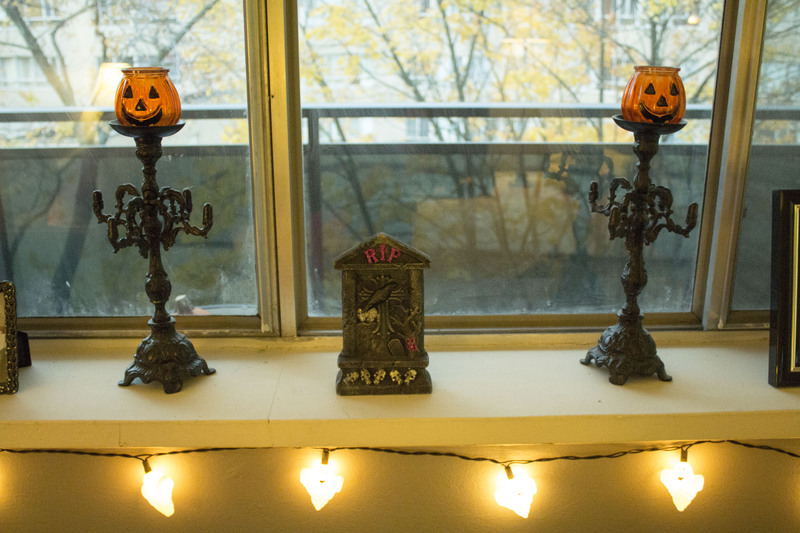 My pumpkin tealight candle holders and mini tombstone that sit on our windowsill are from the Dollar Store. 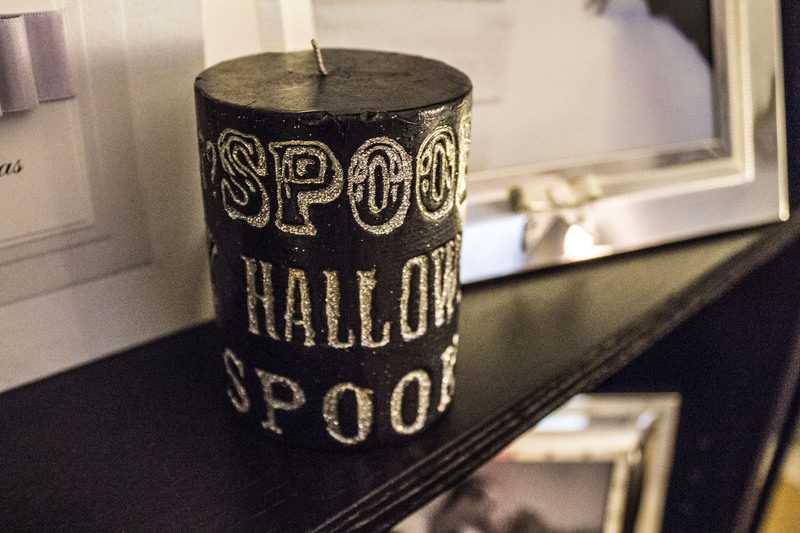 So these little accent pieces cost me a total of $3.00… The dollar store has amazing stuff for Halloween, when I walk in there I like to tell myself its a treasure hunt, you are bound to walk out of there with something. 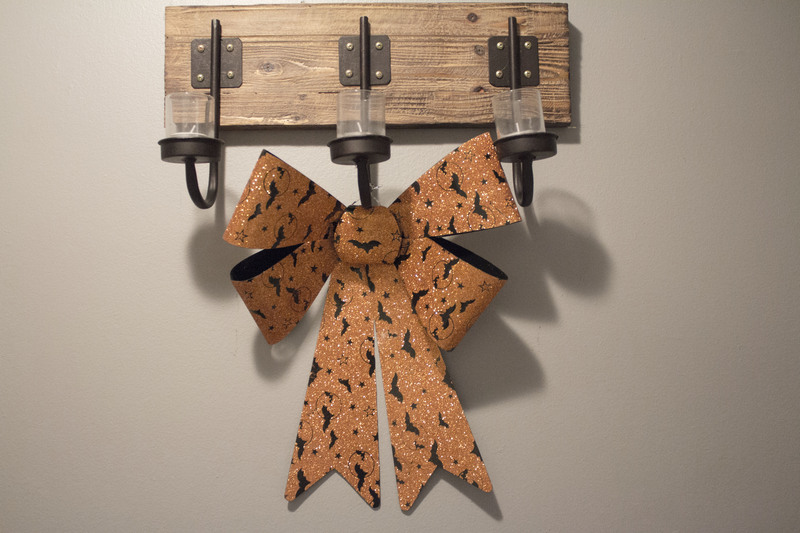 Of course, it wouldn’t be Halloween with Extra Sparkles Please without obviously Sparkles, so when I found this bow I knew I needed to have it and put it in our entrance way. Scary meets cute what more can you ask for?! That also cost me a whopping $1.00! Back to HomeSense where I found the most perfect napkins. They sit all around my house because, of course, if something falls on my carpet I may have a panic attack but they add the perfect amount of Halloween Spirit to every table and side table in our house. They were $4.99 for 100 of them and I must say, I did find another set of perfect napkins which I am not kicking myself for not getting “Drink Up Witches” is what they said, and you can be sure they are going to be sitting on my coffee table next year! 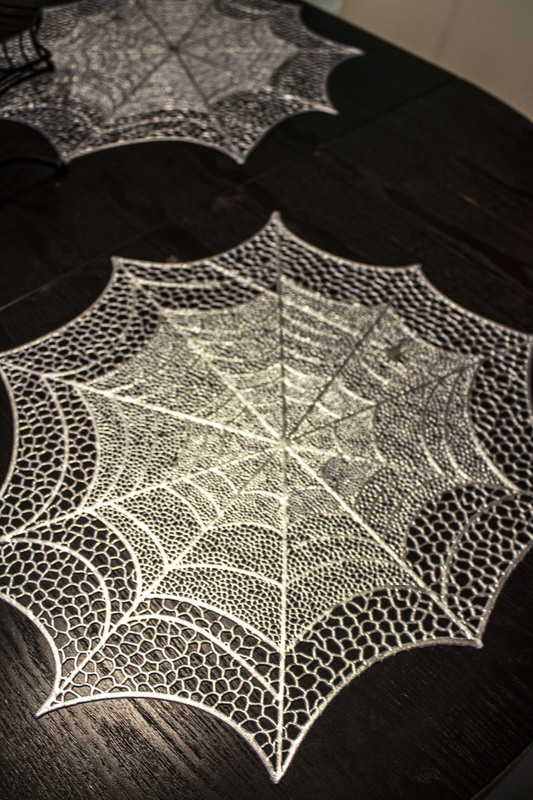 The spider web place mats were $1.99 each (I got 4) and I am so happy I got these, eating dinner on them made things alot spookier in our household. Not to mention, I LOVE the silver, I want to keep them there all year round! 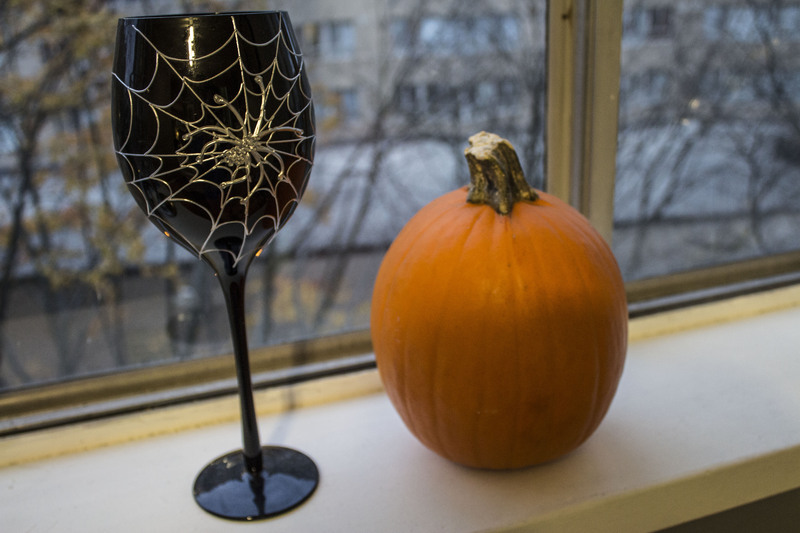 You can’t have spider web place mats without DUM DUM DUM SPIDER WEB WINE GLASSES! At $5.00 each I knew I had to have them, I mean they totally match what more did HomeSense have to sell me on?! 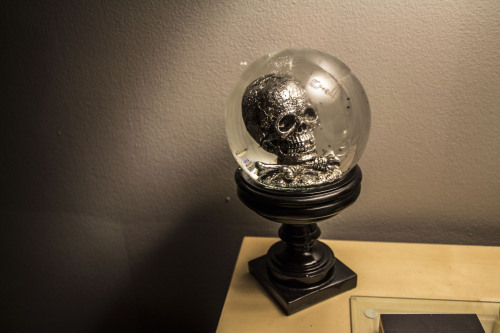 With saving one of the best for last it’s the wonderful crystal ball which as you can see contains a silver skull from HomeSense. It was $12.00 and sits perfectly in on the other side table in our living room, but be sure not to get to close you never know what powers that crystal has! So with this $1.00 sparkly “beware” sign that hangs outside our bathroom door the total of Halloween decor in the last 5 years comes to $99.00! Its not about breaking the bank and getting everything at once, just look at it as adding to your collection. 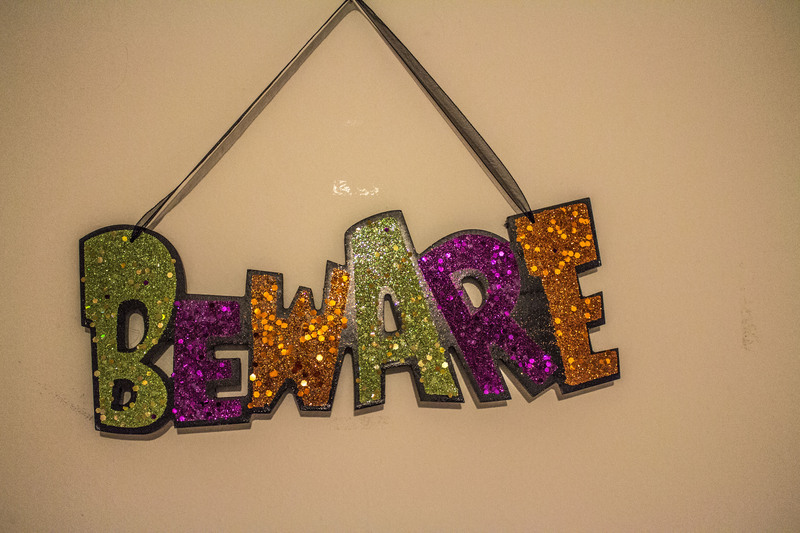 From our spooky household to yours, HAPPY HALLOWEEN 2014… eat lots of candy, cupcakes and if you don’t feel sick from it at the end of the night… you didn’t do it right!